Sugar baron Don Mariano Ledesma Lacson built this ten bedroom Italianate mansion in honour of his wife, who died when she was pregnant with her 11th child. Located on a sugar plantation in the Negros Occidental province of the Philippines, this mansion is the skeletal of a glorious, heroic past. WWII Filipino guerrillas set the house on fire in order to prevent invading Japanese forces from being able to use the building as their headquarters. Although they originally intended it to be burnt to ground, the mansion’s skeleton frame miraculously survived a colossal fire. There is a charming restaurant on the site now and the surrounding grounds are done up beautifully. It is not recommended to climb the second floor of the structure. The place is perfect for taking photos. The easiest way to reach the ruins is to hire a taxi. Love this? Explore the entire list of places to visit in Cebu City before you plan your trip. Fancy a good night's sleep after a tiring day? Check out where to stay in Cebu City and book an accommodation of your choice. 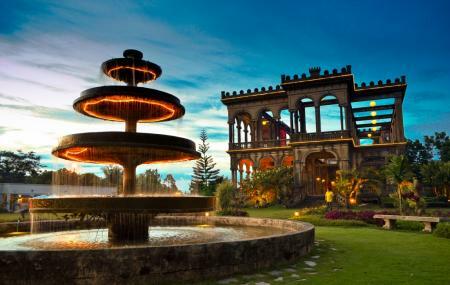 How popular is The Ruins Talisay? People normally club together The Ruins and St. Joseph School - La Salle while planning their visit to The Ruins Talisay. Cool place, the outside koi pond area looks like an ideal location for weddings, events, maybe even a cool wine or beer tasting. The inside is cool, but I think they should not have restored the roof and added a gift shop within the main house. They should have kept it as original as possible or rebuilt using the original materials and methods. The gift shop could have been located in several other open spaces without touching the original ruins. Really nice place, all the garden and ruins clean and quiet around. I really enjoy stay there. The restaurant is expensive so better bring your own snacks. Beautiful and Majestic. I hope everybody will visit this place, it will transport you to the past. It's so romantic at night and you will love to hang around in their Gazebo Ristorante. Don't forget to try their Paella! Nice place to visit the past. And much cozy if you visit during twilight the ruins closes at 8pm. Entrance is 100, students, senior citizens and pwds are discounted. Be sure to bring your ID.